Today in the 'rock room' spins one of my personal favorite LP's, as well a terribly unappreciated and underrated album by one of rocks finest voices. 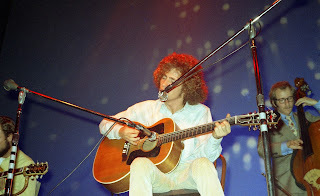 'Folk' singer Tim Buckley is one of the most diverse and experimental rock artists off all time, this being one of the reasons for his popularity and his obscurity. Most of Buckley's fame has come posthumously especially after the popularity and tragic death of his musician son Jeff. Tim's first two LP's 'Tim Buckley', and 'Hello Goodbye' stayed close to the folk troubadour, pop rock tradition with concise well written two minute pop songs. With the release of this LP 'Happy Sad' Tim started to shy away from the mainstream world of pop and rock, and started to drift into experimental jazz arrangements and avant garde vocalizations. 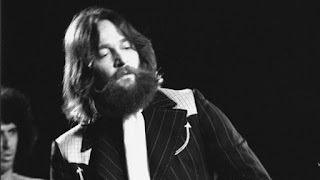 His Miles Davis, Charles Mingus, and Fred Neil influences to name a few had started to seep through his commercial exterior, taking Buckley's music to uncharted areas. These areas are often criticized by media and misunderstood, but for the true artist rules are meant to be broken. There are only six tracks on the 1969 album, because of the expanded length and artistic development of all the songs. Another important point regarding 'Happy Sad' is that for the first time Buckley composed all of the lyrics himself, as well as stripping his band down to congas, bass, vibes, and long time friend and player Lee Underwood on lead guitar, in addition to Buckley's own lush twelve string guitar strokes filling out the sound. The conga/vibe combination gave Buckley's music an ethereal, loose groove always threatening to float away at the sign of the slightest breeze. But this instrumentation also allowed Buckley greater freedom to soar and any moment. This is an important record in both Buckley's career as well as in the history of rock for its display of musical collaborations between genres. Like previously mentioned this LP is the turning point in Buckley's music, eventually culminating in the experimental albums 'Lorca' and 'Starsailor' respectively, which then took his music in unimaginable directions, combining jazz, aural distortion, experimental vocal gymnastics and unique time signatures. 'Happy Sad' is the genesis of these journeys into the deep expanse of space. Buckley straddles the fence between his home and the unknown, in between creating some of his most affecting music in the process. The album opens on the gently swaying groove of 'Strange Feelin' that tip toes in on gently dinging David Freidman vibes. The song oscillates on an axis made of air, suspended on the warm pulse of John Miller's acoustic bass. Buckley's vocals are like a flesh horn, a true tenor with the ability to pierce octaves, smoothy soothing the ear with sneaky melody lines that hang off the churning rhythm set by his earthy twelve string. Rocked like a child snug in his crib, I drift on shifting ground, comforted by Buckley's deep knowing voice, made even more powerful by the sparse instrumentation. A Strange Feelin' indeed. The next track on side one is probably Buckley's most popular and well known song, and for good reason. 'Buzzin Fly' is the signpost pointing to Buckley's new direction, yet rooted in the past, arranged around vibes and acoustic guitar the song elicits sunshine, sandy toes, and lost love. Opening on a resonant acoustic guitar chime, the vibes ring in, and the invigorating popping plucks from Lee Underwood's crystal Telecaster echo Buckley's deep acoustic longing. Tim's cotton delivery in deep blue vibrato shakes me to my roots. The song moves with his breathy vocals on quickly fluttering wings that rise and fall dynamically. The song's fade out gently tickles all synapses with each instrument organically slowing as Buckley soulfully sighs the lyrics "I miss you so'. The final of only three extended tracks on side one is the Buckley opus, 'Love From Room 109 at the Islander (On Pacific Coast Highway). This song begins with the sound of therapeutic waves crashing against the shore in rhythmic time. As the waves continue, a nimble jazz band made up of bass, vibes, and acoustic guitar improvise a light groove that reveals a voluptuous twelve string strike that introduces the song proper. Buckley's riveting vocals enter and the song gains altitude, rising away from the sands and foam and toward the deep blue. The melody which the song balances is timeless, an ancient old sea ballad, or a melody only created from the deepest recesses of someones soul. This is magic in its most artistic and fundamental state. Tossed by the wind and the sea the song rocks buoyantly until it comes to rest on the shore, formless, shining under stars, a dream. Held together by benign bass drones and hollow bells, the songs only form is Buckley's voice, resonate in its emotion, undeviating in its strength, enchanting in its tone. The crashing of the ocean waves the beat, natures metronome, reigning in the delicate instrumentation. When the deep bass marimba swells with the rolling foaming waves, Underwood's seabird guitar sails inches above the breakers, groaning, then resting. The song then concludes as it began with the tender caress of the sounds of the sea. One of Buckley's finest moments as a composer and performer, a must have in any rock collection. Side two begins on the indescribable sound of Lee Underwood's shimmery guitar combined with the pensive chime of the vibes, setting up a musical mood that can only be known by experiencing. A hair raising droning bass note startles my stomach and jumps from the revolving record as Buckley sings. 'Dream Letter' is a musical note composed from a regretful father to the family carelessly left behind. This song is a stirring admittance of grief that tears at the soul both lyrically and musically, with the attentive musicianship only adding to the seriousness of the lyrics. After each verse for only a moment the music seems to play itself, there is no arrangement, no theme, just the sound of the musical notes yearning to exist, only momentary before they fade into the alleys, eardrums, and empty fields of our world. 'Gypsy Woman' was a extravaganza when performed live in concert by this Buckley line up, but the original version on this LP is no slouch either extending to over twelve minutes. Beginning on the multi-rhythmic thump of C.C. Collins congas, some mysterious bass sliding is blended with jungle Buckley interjections, and the song builds slowly like a backwoods tribal gathering, gaining momentum as Underwood's guitar growls with his timely scrubs. As Buckley's excited asides increase, the groove intensifies. This is the one song on the LP where Buckley uses the entire range of his voice from guttural grunts, to climbing and bouncing moves rising up to and running away from notes. Falsetto hollers initiate the band to move forward, drop back, or just hang out and let Buckley groove. 'Gypsy Woman' moves through many frames in its twelve minutes from full blast chunky grooves, to percussion vocal breakdowns, to moments where the sliding sound of fingers on bass is the only lonely backing to Buckley's cries. A powerful and unique expression that again defies categorization. The final song on the album is short, sweet, and straightforward, its also one of Buckley's most enduring melodies. 'Sing a Song For You' (covered by a few artists including Radiohead) is the type of track that says volumes in such a short span of time. The tune to me is Buckley's tribute to the muse, that not only assists him, but will help the subject of the song through their own troubles. The comfort provided by music is at the root of all of Buckley's songs, and is the lifeblood running through the Troubadour. Buckley writes, 'In my world the devil dances and dares to leave my soul just anywhere. Until I find peace in this world, I'll sing a song everywhere I can'. Acoustic guitar and delicate accompaniment on the vibes are all that's needed for this album closer. In every way a perfect ending to a unique journey. 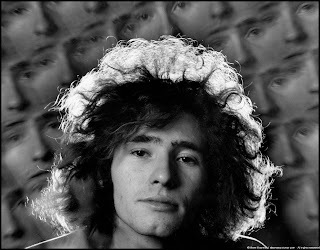 The six songs on Tim Buckley's 1969 LP 'Happy Sad' are of a unique breed and defy classification. Whereas groups like the Band, Flying Burrito Brothers were pioneering 'country rock', the Grateful Dead and Jefferson Airplane were disseminating 'acid rock', Buckley was developing a genre of music that could not be caught or explained and would eventually come to full fruition in 1970 with the career defining 'Starsailor'. Taking pieces and influence from jazz, country, baroque, folk, and vocalists of varying vintage, Buckley created a musical blend that was uniquely his. His vocal and musical developments made some listeners angry because they had no point of reference to understand. Others in the media lashed out because he refused to be boxed in or locked into a genre. Tim Buckley created music that made him 'Happy Sad', if it sold great, if it didn't he would keep creating regardless. 'Happy Sad' was the start of the journey that would take him to musical places he could only dream of. His career, like many musical revolutionaries would only start be understood in the years after his demise. This LP is one of the most important releases that you will never hear of. Listening to this record now will finally allow us to catch up with Buckley's innovative ideas over forty years later. Fortunately we will have the vinyl documents to enjoy and preserve Tim Buckley for the many years to come. I love this album, but you nearly ruined it with your pretentious prose. You can't write. Sorry you did not enjoy my expression of love for this record. Thanks for reading! All I can say is "I miss you so"
Good read Steve. A longtime Tim Buckley fan, I just finished reading Lee Underwood's and David Browne's books on Tim and Jeff. Revisiting one of my all time favorite artists has been a delightful summertime reading process and your article is a good addition to the canon of a latter day Buckley library of appreciation. Thanks for your comments and feedback. Thank you for reading!